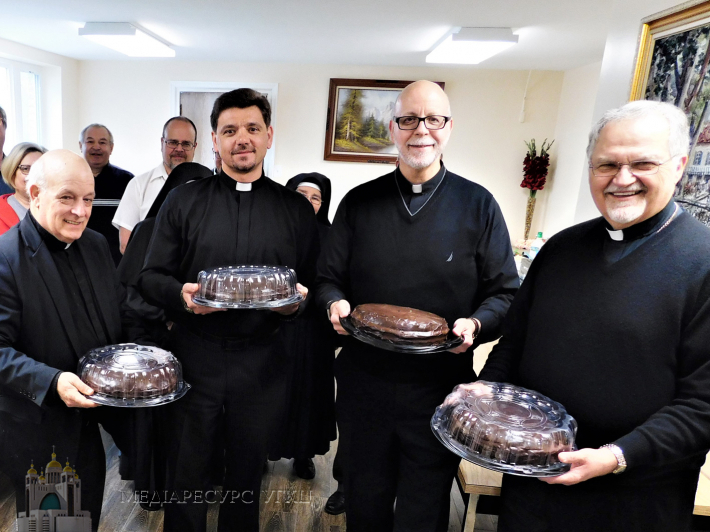 Philadelphia, Pa.--On Wednesday April 25, 2018, Bishop Paul Chomnycky, OSBM delivered quite a number of Boston cream pies to Archbishop-emeritus Stefan Soroka and the Ukrainian Catholic Archeparchy Chancery Staff in Philadelphia. Bishop Paul and Archbishop Stefan placed a culinary wager on the outcome of the February 4, 2018 Super Bowl LII football game between the Eagles and Patriots in Minneapolis. If New England won the Super Bowl, Metropolitan Stefan would have provided a Philly Cheesesteak luncheon to Stamford's Chancery Staff. If the Philadelphia Eagles won the Super Bowl, Bishop Paul Chomnycky, OSBM would provide the Philadelphia Chancery Staff with Boston cream pies. On Monday morning, February 5th, following Philadelphia's unexpected triumph in the Super Bowl, Bishop Paul was contacted at his chancery office. He had this to say with a smile: "I feel rather like Job of the Old Testament sitting in ashes and sackcloth. But I will muster as much good sportsmanship as I can, swallow my pride, fill my car with Boston cream pies and make the trek down to the chancery office in Philadelphia to make good on my bet! I just hope I manage to get a piece of pie!" During the luncheon on Wednesday no one was eating humble pie--rather everyone was enjoying the Boston Cream Pies courtesy of Bishop Paul and the Stamford Eparchy.